The Italian print company DB Ingegneria dell'Immagine SRL has decided to move into the commercial digital print sector with the installation of an HP Indigo 7500 Digital Press. The company which was founded in 1971 as a screen printing business moved to large-format digital print services in the 1990s. Today, DB Ingegneria dell'Immagine, which has four plants in Rome and Milan, has extensively updated its production facilities in order to increase productivity, improve environmental quality and diversify its product portfolio. "The HP Indigo 7500 will help us to avoid outsourcing work to third parties and will allow us to create a useful synergy for attracting new clients looking for both large and small format production," he said. "Our current client base includes large companies in several sectors such as large scale retailing, advertising, manufacturing, energy and telecoms. We are hoping to bring new work to large format via our offering in the small format market and vice versa. The product range will be similar to the traditional offset market: catalogues, books, brochures, cards, leaflets with the option of relying on support from our screen printing colleagues for product enhancement if required." 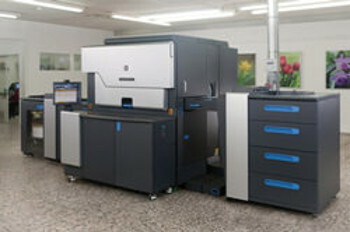 DB Ingegneria dell'Immagine has chosen a four colour configuration for the HP Indigo 7500 Digital Press, with the added bonus that it can upgrade for spot colour and white in the future if there is sufficient customer demand. "As a company we are very focused on differentiation and this has also influenced our expansion," continued Biancavilla. "Our large format clients expect complete, full-service consultancy support from us, initially coming up with solutions and a range of product offerings, then delivery and installation throughout Italy, all within very short lead times." Part of the company's new strategy was to set itself apart from the competition and also to respond more quickly and efficiently to the increasing demands of its clients. As a consequence it decided to introduce a new, independent department fully dedicated to ’small format‘ printing and finishing. The company hopes the HP Indigo 7500 Digital Press will guarantee the same level of quality, contained production costs and high production capacity that distinguishes the company's large format production. "Small format is very different to large format in terms of production, products and materials used (paper rather than plastics)," Biancavilla said. "So we had to carry out thorough research before entering this new market in order to understand how to organise the business. With HP, we have chosen a supplier that can help us ensure we maintain the same high standards for which we are already recognised in the large format sector.. The HP Indigo 7500 was the perfect press for our needs.'"